Zegrino onstage in Rice Auditorium cracking a joke, Feb, 15. Zegrino is the second comedian Student Activities Council has brought to campus this semester. 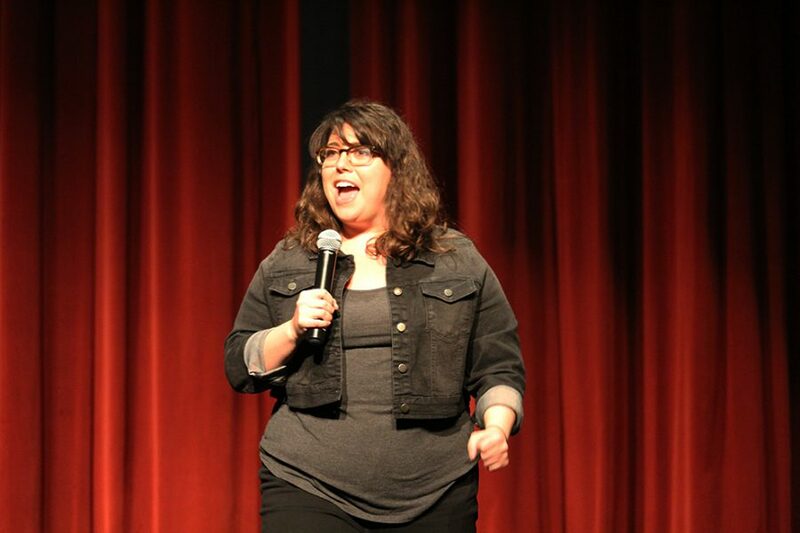 Comedian Jenny Zegrino visited Rice Auditorium on Feb. 15 to perform a set for students and was hosted by the Student Activities Council. Zegrino is originally from the Midwest, but has lived in New York and is now located in Los Angeles. 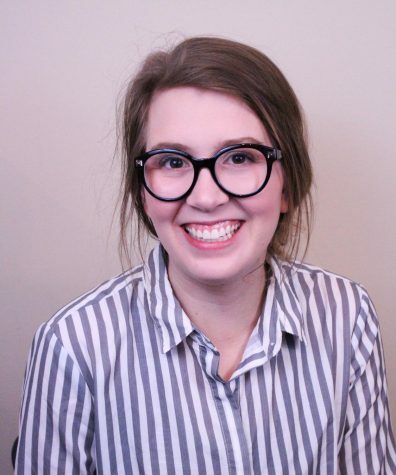 She has been featured on the hit shows “@Midnight”, “Conan”, “MTV’s Girl Code” and “Adam Ruins Everything.” Along with a college tour circuit, Zegrino performs at comedy clubs and private events. Her set featured a variety of topics about her life, her work and the “crusty” nature of Kansas. She also tested a few jokes out on the crowd. This was not Zegrino’s first stop in Kansas as she had visited several other smaller schools in the area. Zegrino was not afraid of audience involvement and asked the crowd about some risqué topics. Zegrino is of Jewish descent and asked if there were any Jewish people in the audience. Freshman Dylan Kort was pointed out by his friends and Zegrino took notice, striking up a conversation. Kort is not devout to Judaism, but rather culturally Jewish. “So you are a Jew-ish Jew?” Zegrino asked. Kort confirmed and then Zegrino went into a conversation about inappropriate pictures, asking Kort if he had ever sent one. The comic also picked on senior Spencer Brown and asked him the same question. While Zegrino was in college her father had another child, Olivia. She made several jokes about the questions Olivia asked her. Overall there were positive reviews of the performance, with lots of laughs from the audience. Freshman Brett George said he enjoyed the show. “My favorite part was when she called out Dylan,” George said. Senior Brittany Crittenden also enjoyed the audience participation. “I liked it because she called out Spencer and I think that was really funny,” Crittenden said.